The money-losing U.S. Postal Service is blocking a federally-mandated prepayment and vying to cut six-day delivery to five. NEW YORK (CNNMoney) -- For the first time, the U.S. Postal Service will ignore a federal requirement and stop making prepayments to its retirement fund in a bid to ward off insolvency. "It's because of our emergency situation," said Postal Service spokesman Dave Partenheimer. "It's something we didn't want to do but we feel that we have no choice." The Postal Service said that its Federal Employees Retirement System is overfunded by $6.9 billion. The prepayments, though required by Congress, are unnecessary, according to the Postal Service. The Postal Service said it is suspending its biweekly payments of $115 million into the benefit portion of the Federal Employees Retirement System. The Postal Service said that suspending these payments will save about $800 million in the current fiscal year, which ends Sept. 30. The next due date for biweekly payments is this Friday, June 24. Partenheimer said the suspension of required payments was a short-term solution "so that we have enough cash at the end of the year to pay our employees and suppliers, and keep the mail moving." Ever since a 2006 act of Congress, the Postal Service has been required to prepay $5.5 billion per year into the fund. But the service's financial situation has become increasingly desperate in recent years, so the organization has been looking for ways to cut costs. "It's a burden that's really impossible for the Postal Service to maintain," said Ruth Goldway, chairwoman of the Postal Regulatory Commission, in an interview prior to the suspension of payments. Sally Davidow, spokeswoman for the American Postal Workers Union, said that a resolution is necessary to protect the employees. "We condemn this whole situation where the government is holding billions of dollars of the Postal Service's money and postal workers' money improperly," she said. Two senators, Susan Collins of Maine, a Republican, and Democrat Tom Carper of Delaware, co-authored the legislation requiring that the Postal Service prepay the $5.5 billion per year. But this year, both senators have issued separate bills that would adjust the requirement. The future of these bills is uncertain. The Postal Service expects to lose $8.3 billion this year. Were it not for the "crushing obligation" of having to make prepayments, Partenheimer said the Postal Service would have actually turned a profit totaling $1 billion from 2007 to 2010. The Postal Service has been cost-cutting aggressively, having reduced its work force by 11,000 jobs and saved $12 billion through cost-cutting over the last four fiscal years. Revenue is the lifeblood of the Postal Service, which operates more like a company than a government agency, since it hasn't been supported by taxes since the 1970s. This is why the Postal Service wants to end its money-losing Saturday deliveries, knocking its six-day delivery service down to five. 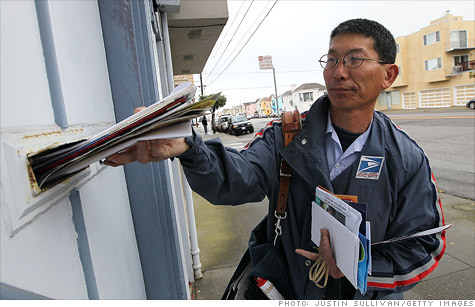 The Postal Service says there isn't enough mail volume, and therefore not enough money, to support Saturday deliveries. The Postal Services estimates that it could save $3.1 billion annually as a result of this change, which would require an act of Congress. The potential elimination of Saturday service is its most controversial proposal. The Postal Regulatory Commission disagrees with the savings estimate, saying the savings would be $1.7 billion per year, little more than half the estimate of the Postal Service. Carper, in a recent interview with CNNMoney, said that his bill also includes a proposal that would give the Postal Service the power to reduce delivery to five days. "We need Congress to give the Postal Service more flexibility to act like a real business," said Carper. "Congress needs to, essentially, get out of the way." Next up on the bailout list: The mailman?